tfw you say you’re ok but you’re not really ok.
My first Paper Mario: TTYD stream was amazing! Every Monday and Tuesday here I’ll be continuing. Drop by to enjoy a game that was a big inspiration to me and Victor (and that we played together before we started dating and during when he asked me out). Oh geeze. Well, I guess I wasn’t wrong for lack of trying. But we got a SHUT UP out of it for the collection! Wow, Blank really does care about him! Also, yay, back to updates! It looked like you were drawing a Blank for a while! TTYD eh? Haven’t ever played that, but I’ll try to make a stream one of these days. Paper Mario is a pretty fun series (hopefully you won’t hate me for thinking Mario & Luigi is better). Actually on topic, certainly an interesting page. 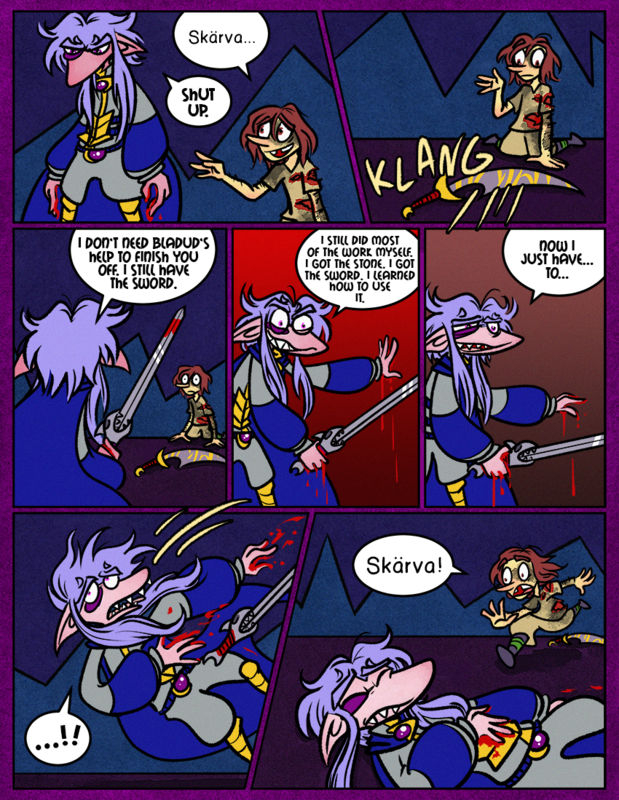 I’m not quite sure if Blank actually likes Skarva here, or if he’s just grateful to not die and being the hero doesn’t want anyone else to die either. Except for Superstar Saga (which I truly adore), M&L never reached the heights of the first three Paper Mario games for me, but at least it’s been more consistent. (I haven’t played Paper Jam so I can’t judge.) Paper Mario has suffered major changes in its gameplay (which I have no real problem with, but many others do) and its writing/scope/creativity (which I have a major problem with) so that the only thing really holding the series together at this point is its art style. TTYD is generally agreed upon as the best in the series. Like I said on the stream, it’s a perfect game. It’s just that Super Paper Mario is better. :p It’s a real shame TTYD hasn’t been re-released so it’s easier for people to get their hands on. Here’s hoping with the Switch. I hope you can drop by, but even moreso I think you’d love to play it for yourself! Well then I really need to finally get a copy of Super Paper Mario. I’ve wanted to play it for over 10 years now, and you of all people would know if a Paper Mario is good. I also think my love of Mario & Luigi could be traced to the fact that Bowser’s Inside Story was the first RPG I ever really liked, and it’s still my favorite. Also whoops I kind of turned a comments section for a webcomic into a Mario RPG debate. SPM is really hit-and-miss with how people feel about it because it’s so different from its predecessors, but since you don’t seem to have a major connection to the first two games, you should be able to go into it with a neutral mindset. I adore Paper Mario and TTYD, but SPM still turned out to be my favorite anyway. The story and the characters have been a huge inspiration for me. In fact, it probably inspired The Fourth (on my end, anyway) more than any other single thing, because the game focuses so much on its quirky villain team to the point that it’s really more about them.